Dennis L. Andress, MD, is the Senior Medical Director for Renal Development with Abbvie. Prior to his employment at Abbvie, he was Clinical Professor of Medicine and Director of the Renal Dialysis Unit at the Division of Nephrology, University of Washington, Seattle, WA. Dr. Andress contributed basic and clinical research discoveries related to complications of chronic kidney disease and end-stage renal failure with over 100 publications in peer-reviewed journals. His research was supported by grants from the National Institutes of Health and the Northwest Kidney Foundation. His current interest is in drug development for diabetic nephropathy particularly as it relates to the endothelin system and to the selective ETA receptor antagonist, atrasentan. Matthias Barton, MD, FAHA, is a graduate of Hannover Medical School, Germany, and since 2007 has been Professor of Cardiology at the University of Zurich in Switzerland. He received his clinical training in internal medicine, cardiology, and anesthesiology at Hannover Medical School and the University Hospitals of Basel, Bern, and Zurich. From 1999, he held a SCORE Career Development Award from the Swiss National Science Foundation to study novel factors involved in coronary artery disease. He has a clinical interest in preventive cardiology. For the past 25 years, his research has focussed on atherosclerosis and the molecular mechanisms and endothelial factors contributing to coronary artery disease and cardiovascular risk. Dr. Barton is a Fellow of the American Heart Association and a member of the International Advisory Board of the International Conferences on Endothelin. 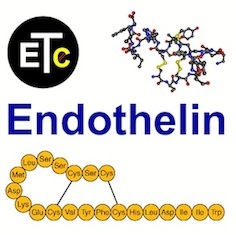 He is Past Chair of the Twelfth International Conference on Endothelin (ET- 12) held in Cambridge, UK, in 2011, and served as Guest Editor of the ET-12 Conference Proceedings, Endothelin XII. Ariela Benigni read Biological Science (Biol. Sci. D. Degree, University of Milan). She researched problems of anti-cancer and anti-thrombotic drugs in Milan and in Strasbourg before joining the Mario Negri Institute for Pharmacological Research in Bergamo, Italy, where she studied mediators of renal damage including the role of endothelin-1 in progressive renal injury (Ph.D. Degree, University of Maastricht). She is currently the Head of Department of Molecular Medicine and Scientific Secretary of Mario Negri Institute for Pharmacological Research of Bergamo. She has contributed to more than 230 research publications. Her recent work has looked at therapies to halt renal disease progression or even induce regression of kidney lesions by multidrug approach with the interest to characterize cellular determinants of kidney repair after angiotensin II blockade. She acted as Associate Editor of Kidney International, Journal of Nephrology and International Journal of Artificial Organs; actually she is Editor of Expert Opinion on Therapeutic Patents and PeerJ. She was consultant of WHO for a multicentre observational study on the predictive ability of angiogenic factors for Pre-eclampsia. For this latter study she has been appointed as Senior Fellow by the University of Oxford, Nuffield Department of Obstetrics & Gynaecology. She was the Chairman of the 10th International Conference on Endothelin (ET-10), hold in Bergamo 2007. She has recently been named to take part to the Visiting Committee of AERES – Agence d’Évaluation de la Recherche et de l’Enseignement Supèrieur – for the evaluation of scientists at the Hôpital Necker in Paris and she received the Merit Award of Bergamo City Hall for her contribution to science. Carmine Cardillo is a professor of Internal Medicine, head of a Division of Internal Medicine and chief of the Vascular Physiology Laboratory at the Catholic University Medical School in Rome, Italy. He received his M.D. and his fellowship in Internal Medicine from the Catholic University. He also served for almost 4 years as a Visiting Scientist at the Cardiology Branch, NHLBI, of the National Institutes of Health in Bethesda, MD, USA. In addition to practicing and teaching, Dr. Cardillo has been involved for long time in research on the mechanisms of vascular dysfunction in patients with risk factors for cardiovascular disease. In particular, he has studied changes in the main endothelial homeostatic mechanisms, including the nitric oxide pathway and the endothelin system, in hypertension, diabetes and hypercholesterolemia. He has also investigated the determinants of impaired vasoactive properties of insulin in conditions like obesity and the metabolic syndrome. He has authored almost one hundred peer-reviewed articles on these topics. Martine Clozel, Actelion Pharmaceuticals, Ltd, Allschwil, Switzerland Martine Clozel, a paediatrician specialized in neonatal intensive care, obtained her MD degree at Nancy University, France, and received further training in physiology and pharmacology from McGill University, Montreal, and the University of California, San Francisco. During her 11 years at F. Hoffmann-La Roche Ltd, she initiated the research project on endothelin and endothelin receptor antagonists (ERAs) which led to the discovery and clinical development of bosentan (Tracleer), tezosentan, clazosentan and macitentan. Her group has published over 150 peer-reviewed papers in the fields of endothelial function, endothelin and ERAs. In 1997 she was awarded the Hoffmann-La Roche Research Prize for her achievements in the field of endothelin research. In 1997 she co-founded Actelion Pharmaceuticals Ltd, where she is Senior Vice President and since 2009, Chief Scientific Officer. Martine Clozel is a member of the Scientific Editorial Board of Science Translational Medicine. In 2008, she was honoured as “Chevalier dans l’Ordre de la Legion d’Honneur”. Hunter C. Gillies, MD, is a Senior Director in clinical research at Gilead Sciences Inc. San Francisco. He spent the past 13 years in the pharmaceutical industry working on clinical drug development, primarily focusing on the cardiovascular effects of phosphodiesterase type 5 inhibitors (PDE5i) and endothelin receptor antagonists (ERA). For the past eight years has worked in the field of pulmonary hypertension including clinical research and trials in PAH and PH secondary to chronic lung disease. Currently his research focus involves clinical trials involving new pharmacological targets and exploring the potential for pharmacological synergy between PDE5i and ERAs. He has a number of peer reviewed publications on cardiovascular physiology and pharmacology, exercise physiology and the development of PD5i for cardiopulmonary disorders. Anil Gulati, MD, PhD, FCP, is a Professor of Pharmaceutical Sciences and Associate Dean for Research at the Midwestern University. He is a United States Fulbright Scholar 2008-2009 and winner of International Ranbaxy Research Award 2007. He obtained his M.D. in 1982 from King George’s Medical College, Lucknow, India and became Diplomate American Board of Clinical Pharmacology (1992). He was awarded a Ph.D. in 1996 by Erasmus University Rotterdam, The Netherlands. He is a Fellow of the American College of Clinical Pharmacology. He has more than 265 peer reviewed publications and guided research of more than 70 graduate students and research fellows. Dr. Gulati has 21 patent applications (six issued patents) and has founded three companies. Medications developed by Dr. Gulati are undergoing clinical trials in the United States and India. After graduation from the German School of Athens, Dr. Theofilos M. Kolettis obtained his MD degree from Medical School, University of Athens in 1984 and his PhD in 1991. He trained in Cardiology at the Edinburgh Royal Infirmary, U.K and at the Athens General Hospital. He worked as a clinical research associate at the Department of Electrophysiology, Eastern Heart Institute, NJ, and as an attending physician at the Onassis Cardiac Surgery Center, Athens, Greece. He is currently Professor in Cardiology at the University of Ioannina, Greece. Dr. Kolettis practices in the field of cardiac pacing and clinical electrophysiology. His research interests include the study of the pathophysiological effects of endothelin during myocardial infarction, focusing on ventricular remodeling and tachyarrhythmias. Hiroki Kurihara, MD, PhD, is a Professor of Molecular and Cellular Biology at the University of Tokyo Graduate School of Medicine. He contributed to the discovery of endothelin in 1988 and first reported endothelin-1 knockout mice in 1994. His present research interests are craniofacial and cardiovascular development and the involvement of neural crest cells. He also acts as a member of Institute for Biology and Mathematics of Dynamical Cell Processes (iBMath), the University of Tokyo, to promote a relationship between medicine and mathematics. Dr. Langleben is a Professor in the McGill University Faculty of Medicine, and former Chief of Cardiology of the Jewish General Hospital. He founded and directs the Center for Pulmonary Vascular Disease, the first pulmonary hypertension clinic in Canada. His research interests include lung vascular metabolism; behavior and function of lung vascular cells; vascular cell biology; epidemiology of pulmonary hypertension, and the development of new medications for pulmonary hypertension. His work has been supported by the Medical Research Council of Canada, The Canadian Institutes for Health Research, the Fonds de la Recherche en Santé du Quebec, the Heart and Stroke Foundations of Quebec and Canada, and the Quebec Lung Association. Hiromi Matsubara, MD, PhD, is currently the Director of Department of Clinical Science and Division of Cardiology at National Hospital Organization Okayama Medical Center, Okayama, Japan. After receiving his MD from Okayama University Medical School and finishing his residency in internal medicine at National Okayama Hospital, he began his fellowship at National Cardiovascular Center, Osaka, Japan in 1990. He became an Assistant Professor of Department of Physiology II at Okayama University Graduate School of Medicine and Dentistry in 1993. He then became an Assistant Professor of Department of Cardiovascular Medicine in 1997 and again promoted in 2000 to the Associate Professor of Cardiovascular Medicine. He then became the Director of Division of Cardiology at National Hospital Organization Okayama Medical Center and he also serves as the Director of Department of Clinical Science since 2010. His investigative interests have focused on clinical and physiologic aspects of pulmonary hypertension. He has made Division of Cardiology at National Hospital Organization Okayama Medical Center as one of the largest pulmonary hypertension center in Japan. Dr. Jennifer S. Pollock is a Weiss Professor and the Director of the University System of Georgia MD/PhD Program at Georgia Regents University. She earned her Ph.D. in Biological Chemistry from The University of North Carolina at Chapel Hill and received post-doctoral training under the tutelage of Dr. Ferid Murad, 1998 Nobel Laureate in Physiology and Medicine. Subsequent to her post-doctoral training, she worked as a Drug Discovery Scientist at Abbott Laboratories before moving to GRU in 1995. Dr. Pollock’s research is on the vascular and renal mechanisms of hypertension and diabetes focusing on the role of nitric oxide and endothelin in the relationship of stress on the vasculature, renal function, and immune responses. Her research is currently supported by two Program Project Grants from the National Institutes of Health. Dr. Pollock serves as a member of two AHA study sections and as an ad- hoc reviewer for NIH Program Project Grants. Dr. Pollock has mentored and trained over 60 undergraduate students, medical students, graduate students, post-doctoral fellows, clinical fellows, and junior faculty members in her tenure at GRU. Francesca Spinella, PhD, graduated in Biology from the University of Catania in 1995, obtained her PhD degree in Neurobiology from the same University in 1999. As PhD student she has worked in professor De Vellis’ laboratory in Los Angeles, CA. She is actually senior investigator at the Regina Elena National Cancer Institute of Rome where she has been working on endothelins since 2001. As a research fellow funded by Italian Association for Cancer Research (AIRC; 2002-2004), she has been working in Dr. Anna Bagnato’s laboratory in Rome studying the role of endothelins on the cell-cell interaction and communication on melanoma cells. Of particular interest is the analysis of signal transduction pathways through which ET-1 triggers cancer progression, with special attention on the role of ET-1 in promoting angiogenesis and tumor cell invasive behavior. In 2010 she was Principal Investigator in a project funded by AIRC in which she defined many critical activities of ET-1 in the induction of lymphangiogenesis. Currently, Dr Spinella’s research is focalized on the study of mechanism by which blocking ETBR could lead to tumor angiogenesis and lymphangiogenesis reduction, as potentially candidate in the inhibition of hematic- and lymphatic-driven metastatization. Pierre-Louis Tharaux, MD, PhD, since 2009 has been INSERM Research Professor and group leader at INSERM Paris Cardiovascular Research Center (PARCC), Hopital Européen Georges Pompidou, Paris, France. He completed his medical studies at Faculté Necker-Enfants Malades- Université Paris Descartes, followed by residency and a nephrology fellowship at the Hôpitaux de Paris (nephrology board-certified in 1998). He received his medical doctorate from Université Paris-Descartes, and a PhD in physiology and pathophysiology from Université Pierre & Marie Curie. He also completed a curriculum in physiology and pathophysiology of sleep and cardiovascular disorders at Université Paris-Sud. His scientific interests include the pathophysiology of the renal circulation. The research in his laboratory is centered on the analysis of mouse vascular and renal pathophysiology, with a particular emphasis on genes implicated in signaling pathways. His work covers three areas: (1) G-proteins coupled receptors (GPCRs) and tyrosine kinase receptors (TKR) signaling in podocytes in response to immune vasculitis with rapidly progressive glomerulonephritis (RPGN), diabetic nephropathy and in focal segmental glomerulosclerosis (FSGS); (2) Signaling in podocytes and endothelial cells in sickle cell Nephropathy and vasculopathy, and (3)immunopathogenesis of sickle cell disease. Paul M. Vanhoutte, MD, PhD, FAHA, is a Chair Professor in the Department of Pharmacology and Pharmacy of the Li Ka Shing Faculty of Medicine of the University of Hong Kong. He obtained his M.D. degree at the University of Gent, Belgium. He has been Professor of Pharmacology at the University of Antwerp, the Mayo Clinic, Rochester MN, and Baylor College of Medicine, Houston TX. From 1992 to 2002, he was Director of Discovery Research at Servier near Paris in France. Dr. Vanhoutte is Doctor honoris causa of the Universities of Gent, Antwerp, Zurich, Montréal and Strasbourg, of the RMIT University in Melbourne, Australia, and of the Gr. T. Popa University in Iasi, Romania. Dr. Vanhoutte is a Highly Cited Researcher (ISI) in three categories: Biology & Chemistry, Pharmacology, and Clinical Medicine. Dr. Vanhoutte is the Past Chair of the Third International Conference on Endothelin (ET-3) held at Housten in 1993 and Past Honorary Chair of the Sixth International Conference on Endothelin ET-11) held in Montréal, Canada, in 1999, the Ninth International Conference on Endothelin (ET-9) held in Park City, Utah, in 2005 and the Twelfth International Conference on Endothelin (ET-12) held in Cambridge, UK, in 2011. David J. Webb, MD, DSc, FRCP, FRSE, FMedSci, is Professor of Therapeutics and Clinical Pharmacology in the BHF Centre of Research Excellence at the University of Edinburgh, where he established its Centre for Cardiovascular Science, and consultant physician at the Royal Infirmary of Edinburgh. He is recognised internationally for his work on endothelial function and arterial stiffness, much of which focuses on the endothelin system, and on the investigation and effective treatment of patients with complex hypertension and chronic kidney disease. His work is mainly translational and he provides leadership to two new UK clinical PhD training initiatives in translational medicine and therapeutics (TMAT) based in Scotland, funded by the Wellcome Trust and Medical Research Council. He is a Fellow of the Royal Society of Edinburgh and UK Academy of Medical Sciences, and was awarded the SKB Silver and Lilly Gold Medals from the British Pharmacological Society for his research and for contributions to pharmacology, respectively. Dr. Webb was Chair of the Seventh International Conference on Endothelin (ET-7), held at Edinburgh in 2001. He is a member of the International Advisory Board of the International Conferences on Endothelin. Jun Yamashita, Kyoto, Japan Born in Kyoto in 1965. Graduated from Kyoto University School of Medicine in 1990, entered Kyoto University Graduate School of Medicine in 1993, specializing in physiology. Gained a Ph.D. in medicine in 1998 and became a special researcher at the Japan Society for the Promotion of Science. After periods as an assistant professor and then an associate professor in Department of Molecular Genetics at Kyoto University Graduate School of Medicine, in 2003 was appointed an associate professor in Department of Stem Cell Differentiation at Kyoto University Institute for Frontier Medical Sciences. In 2008, concurrently appointed an associate professor at the Center for iPS Cell Research and Application (CiRA) at Kyoto University Institute for Cell-Material Sciences. He took up the current position in 2012. Masashi Yanagisawa, MD, PhD, is an Investigator of the Howard Hughes Medical Institute (HHMI) and Patrick E. Haggerty Distinguished Professor of Molecular Genetics at the University of Texas Southwestern Medical Center at Dallas. Since 2010, he doubles as Professor and Director of the International Institute for Integrative Sleep Medicine at the University of Tsukuba. Dr. Yanagisawa discovered endothelins, their receptor and processing enzymes, and demonstrated their roles in the embryonic development. Later he also discovered the orexins and their receptors, molecules that regulate sleep and wakefulness. Promising therapeutic applications have emerged from both of his lines of exploratory research. Dr. Yanagisawa is a member of the US National Academy of Sciences, and member of the International Advisory Board of the International Conferences on Endothelin. He was honorary chair of the Tenth International Conference on Endothelin (ET-10) held in Bergamo, Italy, in 2007, the Eleventh International Conference on Endothelin (ET-11) held in Montréal, Canada, in 2009, and the Twelfth International Conference on Endothelin (ET-12) held in Cambridge, UK, in 2011. Session 9: Blocking the ETA Receptors: What's New?